The Epic E1000 is an American six-seater turbo-prop light aircraft under development by Epic Aircraft in Oregon, US. The single-engined plane first took flight in 2015 and is expected to be released to buyers within a year, pending certification requirements. 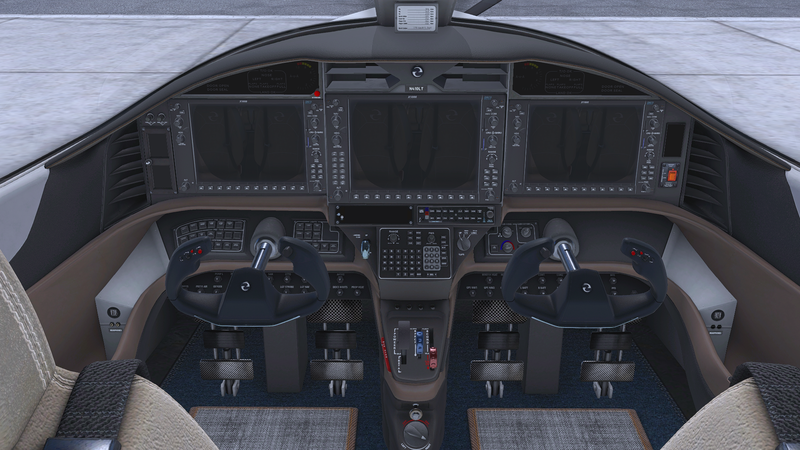 Renowned X-Plane aircraft developers Aerobask took it upon themselves to re-create the E1000 in Laminar’s sim, first in 2016 with the E1000 Skyview and now 2019 with the release of the Epic E1000 - G1000 Edition. Today we take a look at Aerobask’s latest offering, the Epic E1000 G1000 Edition. Installation, like most things in X-Plane, is a breeze. Simply place the file provided into your X-Plane 11\Aircraft folder, then load up the sim and spawn in with the plane. It will then ask for your serial number - simply paste it in, reload the aircraft and you’re ready to go! I will also touch briefly on the method of updating in this section since it seems appropriate. 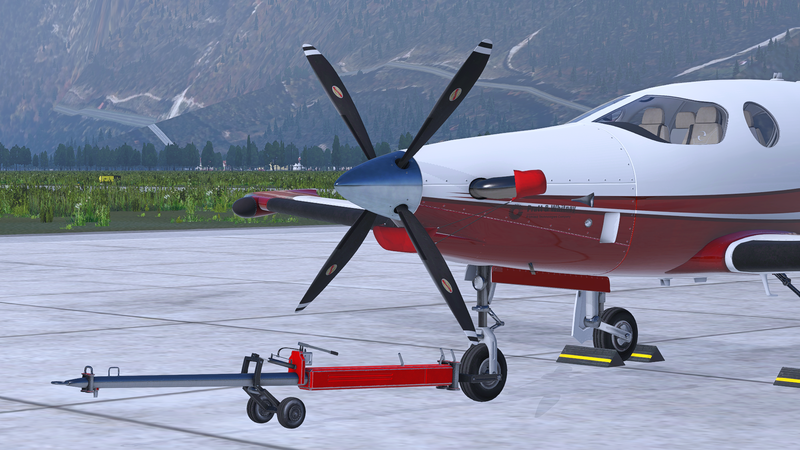 Aerobask have elected to use the intuitive Skunkcrafts Updater for this aircraft, which is an extremely simple tool to use. 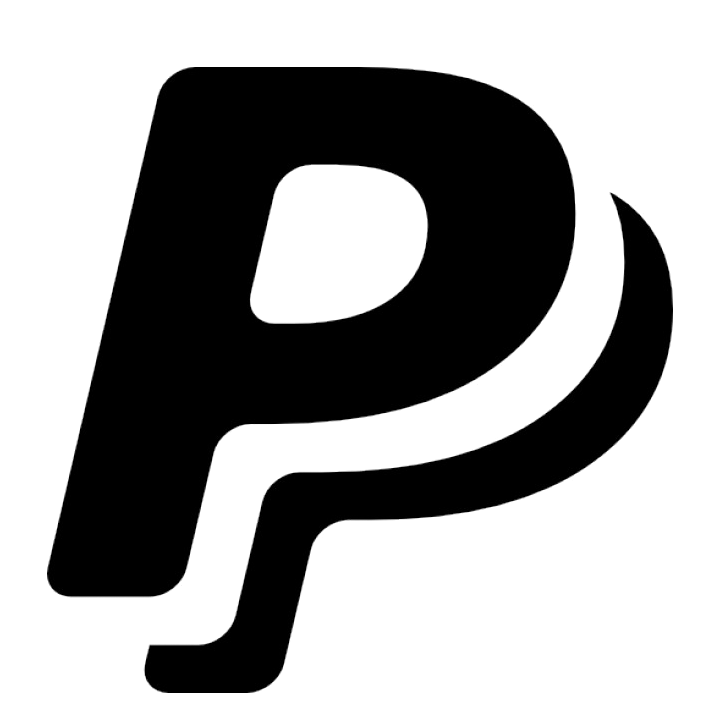 If an update becomes available, provided you have the plugin installed, you can simply update whilst in the sim, then continue flying after you’ve updated. Here’s a quick screenshot of myself updating the E1000 using the Skunkcrafts Updater. 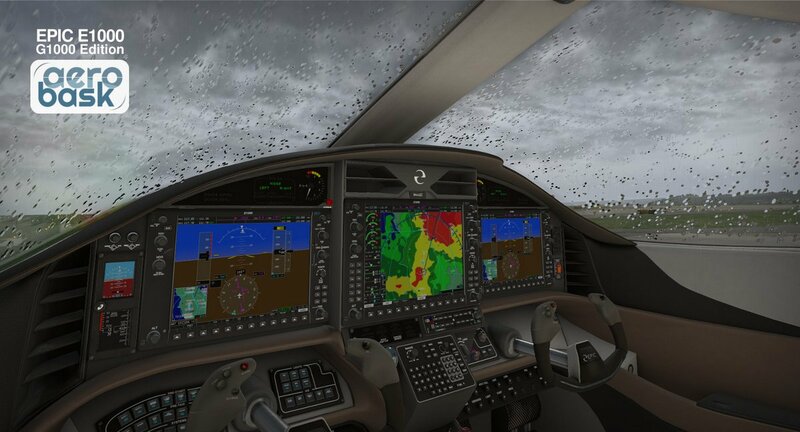 Aerobask have provided extensive documentation with the new E1000 G1000 Edition, including a variety of simulator-based and real-world manuals. Alongside a real-world Pratt & Whitney Canada “Know Your PT6A” owners handbook are assorted documents outlining the E1000’s performance guidelines and in-sim features such as AviTab configurations and recommended installation settings. Also included is a normal operations checklist, which consists of 11 pages of very helpful information detailing 15 normal stages of flight. The main manual is 34 pages long and is filled with great information, which I consider mandatory reading. It begins with a section about the plane and its specifications, which refers heavily to the real-world Pratt & Whitney PT6A owners handbook mentioned earlier. Also listed are the minimum system requirements for the aircraft, which are as follows: i5 6600 (or equivalent), GTX 960 with a minimum of 4GB VRAM and 16GB of RAM. 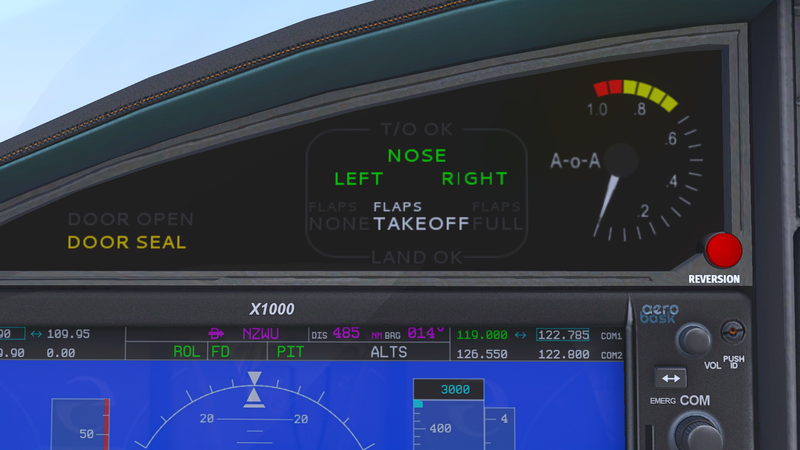 Moving onwards, there is a visual cockpit orientation diagram, walking you though many of the features of the instruments in the E1000, including the custom “touch-screen” G1000, based off the X-Plane default instrument of the same name. After this, the manual outlines a tutorial flight from Schwerin-Parchim (EDOP) to Magdeburg City (EDBM), something I found extremely helpful in my first few hours with the bird. The manual is one of the most comprehensive I’ve ever read for an aircraft in X-Plane and covers virtually all the aspects of the E1000. This isn’t even mentioning the other 6 documents that come bundled in the package covering various other items. I commend Aerobask on this, as it saved me countless frustrated hours trying to learn the aircraft the hard way! The interior of the E1000 G1000 Edition certainly lives up to Aerobask’s rigorous standards. With beautiful leather seats and sleek fittings, the Epic E1000 has an undeniably nice looking cockpit and is well represented here by the developer. 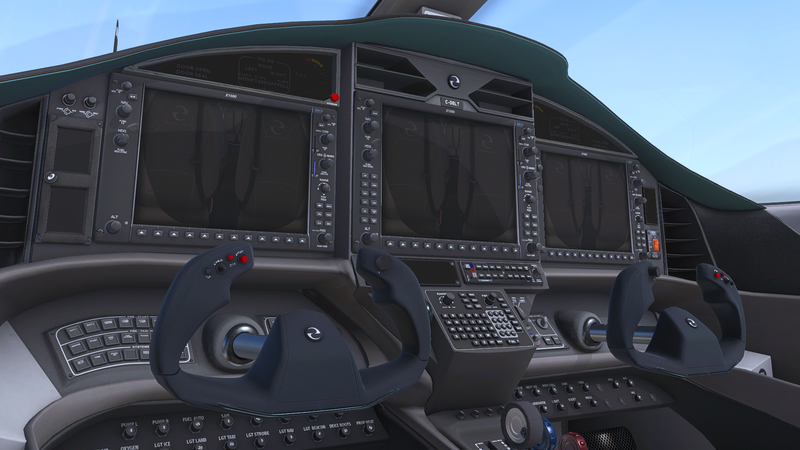 The cockpit of the E1000 prominently features 3 Garmin G1000s, all of which are modelled in X-Plane using modified Laminar Research default avionics sets. 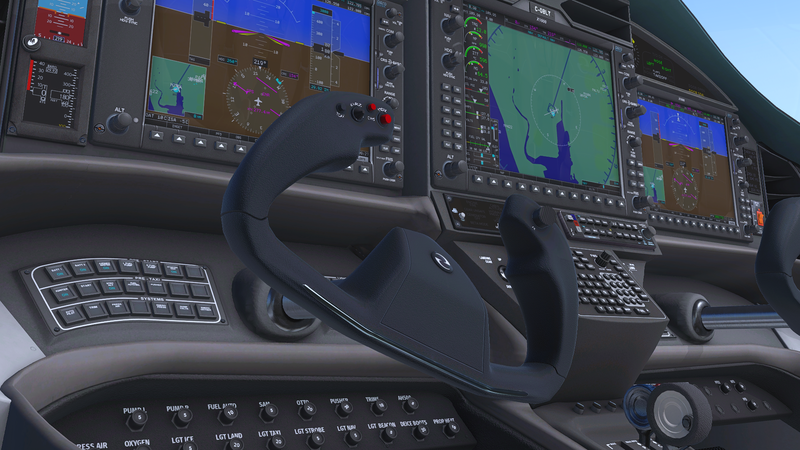 I won’t be commenting on the default G1000s, besides a few tweaks Aerobask has made to them. The main change is the addition of a “touchscreen” effect for changing values on the PFD. Tapping the altitude bug will bring this screen up, from there allowing you to specify an altitude. This works well, aside from confirming the selection. The proper method confused me at first - you must tap the entry field (where the selected value goes) to confirm the altitude. Disregarding this little hiccup, the G1000s perform as expected, and integrates well with the E1000. This is a bit of a side note, though I’m a little disappointed that Aerobask haven’t opted to include any of the features in the G1000 NXi used in the E1000. 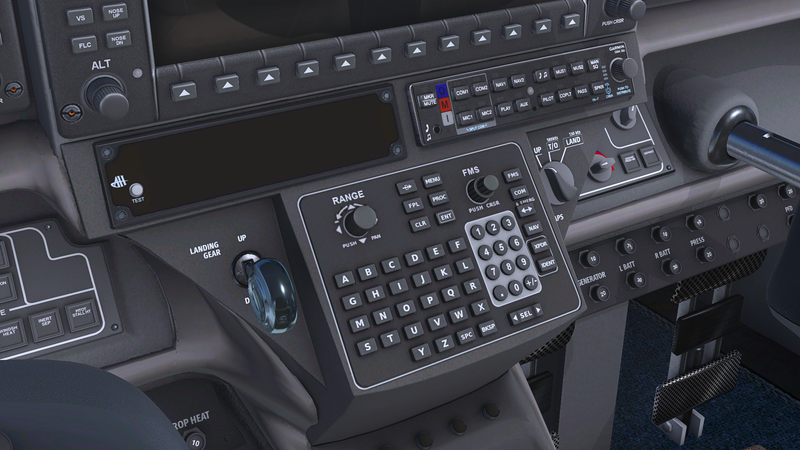 It seems as though modifications are possible to the Laminar G1000, so perhaps some of the NXi’s new features (i.e. synthetic vision and other improvements) could have been implemented? In terms of other avionics, Aerobask have opted to include an MD302 Standby Altitude Module, developed by SkunkCrafts and produced in the real world by Mid-Continent Instruments. This is exceptionally well modelled/implemented and bears almost no difference to any of the reference images I found. The MD302 Standby Altitude Module by SkunkCrafts, complete with pop-up. 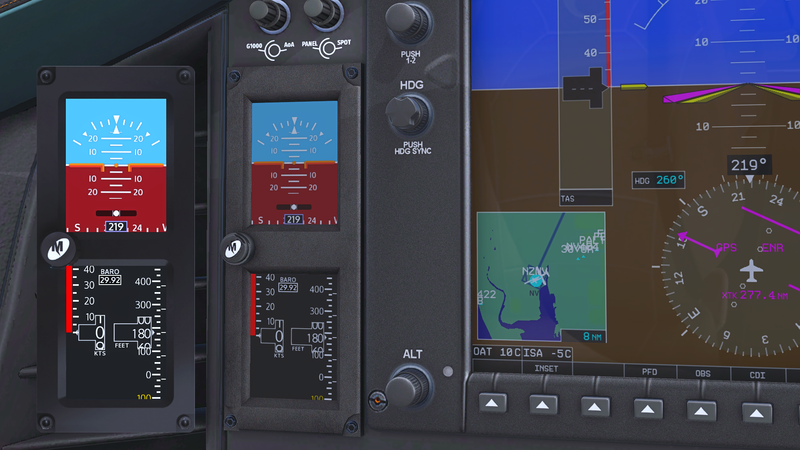 One notable difference between real-world and sim is the lack of a separate autopilot panel, which in the real aircraft is located next to the stereo bar underneath the central screen. In the E1000 G1000 Edition, Aerobask have opted to replace it with an annunciator panel - something which I personally don’t mind. Aerobask have opted to replace the autopilot panel with a row of annunciators. Speaking of annunciators, there is another set located above the main G1000 screen, which contains an Angle-of-Attack indicator, flap/gear information and door light. The information on the panel matches that of the real aircraft, but the Aerobask version really squishes the text together, making the proportions all out of whack. I would have liked a glass covering to be placed over the LED lights on the panel also, as it would more closely mimic the real thing. The annunciators directly above the main G1000 screen are very cramped. Moving onwards, buttons and knobs located on the lower section of the cockpit are very nicely done and give a tactile effect when pushed. In combination with the FMOD sounds in the aircraft (see the Sounds section for more), this gives a very realistic feeling. One of the last things I’ll comment on about the interior of E1000 is the yoke. It is modelled very nicely, however, it doesn’t seem to emulate the different materials Epic Aircraft used on the main handholds, instead, Aerobask have opted for an all leather finish. This doesn’t really bother me as it’s a really nit-picky thing to bring up, though. One larger complaint I have about the yoke is it’s turning animations. For such a light and nimble aircraft, the yoke animation is very slow and feels sluggish. It is quick to “max” out it’s turning radius too, as it doesn’t appear to twist past about 35-40 degrees. 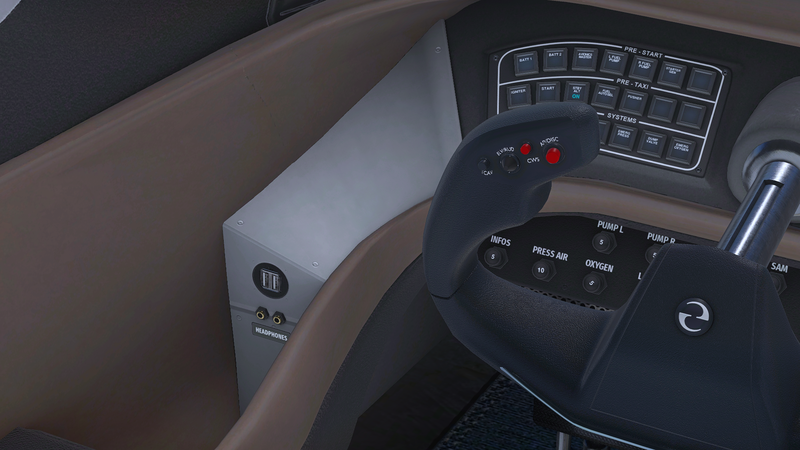 Lastly, it’s a little disappointing that none of the buttons on the yoke are operable, for example, the autopilot disconnect toggle. The yoke at maximum turning radius. A cosmetic feature I really love about the E1000 is the coloured dashboard trim which changes based on the livery you’re flying with. For example, in this livery, the cockpit is outfitted with bright yellow panels, whereas if we fly in a blue livery, the dash changes accordingly. 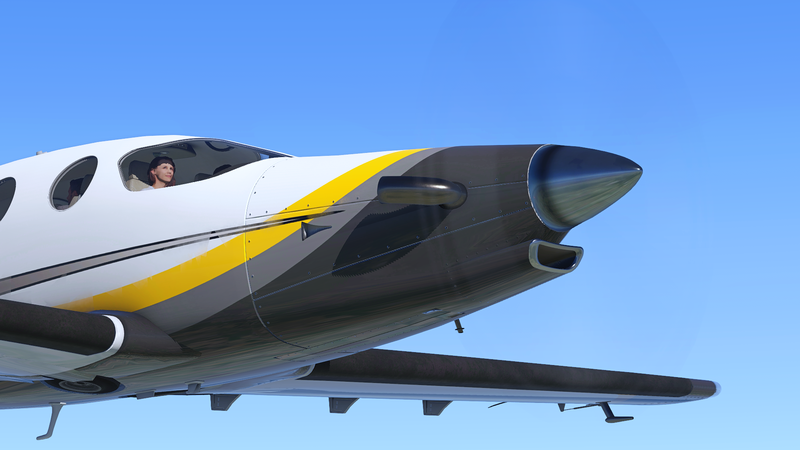 Whilst certainly pleasing to the eye, it is actually not as realistic as the previous version of Aerobask’s E1000, which follows the real aircraft (in the reference images I found) in using more subtle trim accents. This is just a little thing though, in fact, I like the way Aerobask have made the effect more pronounced compared to the real-life variant. The cabin is also represented well - the tan leather seats look extremely comfortable. 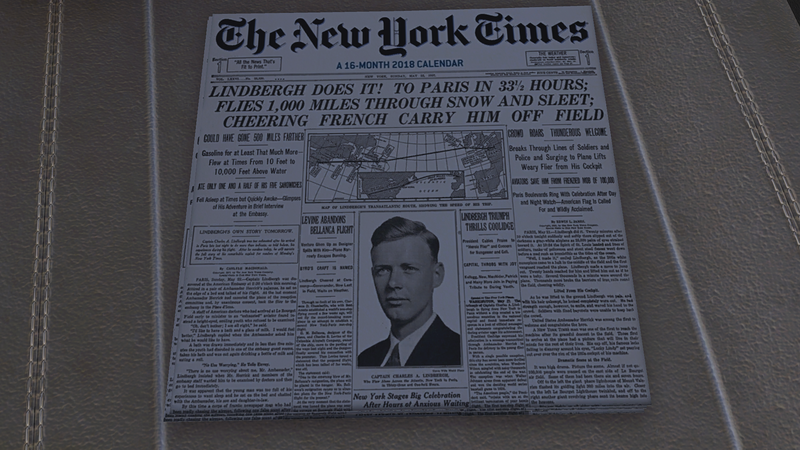 The developers have also included a copy of the New York Times on one of the seats, dated May 20th, 1927 - the day Charles Lindbergh arrived in Paris after becoming the first man to cross the Atlantic non-stop in an aircraft. A very nice touch! 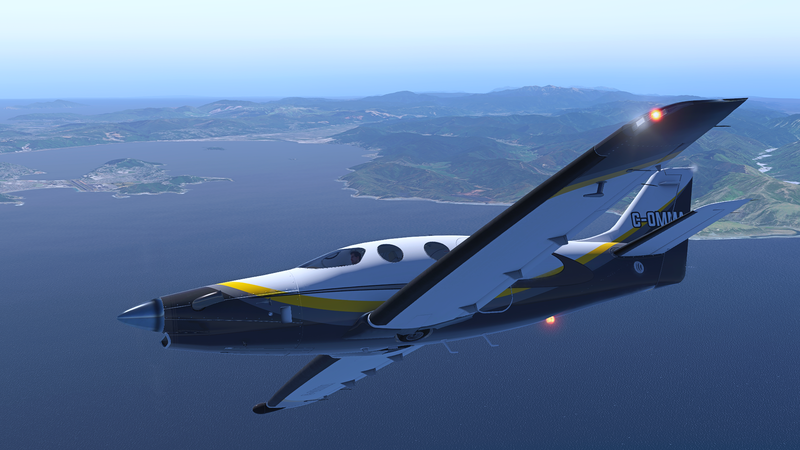 The exterior of the Aerobask E1000 G1000 Edition is just as beautiful as the interior. The developers say they’ve completely re-worked the exterior model, bringing it up to current standards. This is very much welcomed and gives the E1000 G1000 edition a very sleek and nimble appearance, much like the real thing. Onto ground objects. Once again, these are modelled in very high-quality. 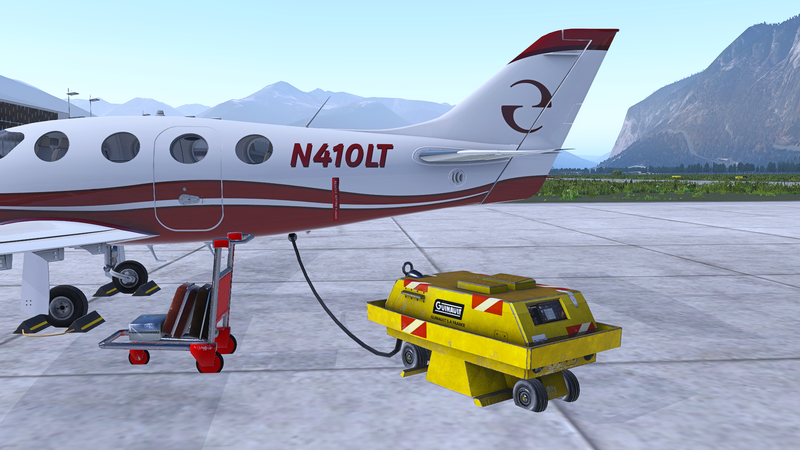 Aerobask have included 3 exterior objects not connected to the aircraft, called “static elements” in the menu - a baggage trolley, ground power unit and a tow bar. These are all textured just as well as the aircraft itself, bearing much resemblance to the real thing due to the carefully placed wear effects. Numerous “Remove Before Flight” tags and covers are attached to the aircraft pre-flight also. Overall, the exterior of the E1000 G1000 Edition is worthy of the Aerobask tag. It is well modelled, textured and finished to give a professional and sleek look, much like the real aircraft is intended to. I’m just going to say it: The sounds on this aircraft are fantastic! Daniela Rodríguez Careri, the developer responsible for the FMOD soundpack bundled with the E1000 G1000 Edition, has done it again. Let’s start with the main event: the engine. The developer has absolutely nailed familiar whine of the Pratt & Whitney PT6A, making fly-by shots even more spectacular. Upon landing, I was pleasantly surprised by the beta range sounds (does the job of thrust reversers but for a turboprop), and the memories of plane-spotting spontaneously came flooding back. Start-up and shut down are still two of my favourite parts of flying with this aircraft, purely because of the sounds. The gentle clicking of the igniter is slowly drowned out by the engine spool up sounds very well refined and though I couldn’t find any real-world E1000 start-up videos, I trust they are accurate to the real thing. Ambient sounds are no less impressive on the E1000. In the cockpit, you’ll find the buttons give a satisfying tactile bump when pressed, something I’m a fan of. This is most apparent on the keypad on the centre console, featuring a variety of noises based on the size of the key pressed. The ground power unit is one of the more notable uses of the features available with FMOD sounds. Distance and relative position to the unit are taken into account with the whining generator noise here - opening and closing the door nearest the GPU gives a convincing muffling effect too. All of this can be managed either through the menu or by using the clever click-spot on the headphone jack, underneath the USB port. The headphone jack - a perfect place to hide a master volume selector! Let’s get one thing out of the way: the E1000 is a very fast aeroplane. Make no mistake - this was by design. The E1000 project’s aim is to make the fastest single-engine civil aircraft, and succeed they have. Aerobask’s rendition of the E1000 faithfully represents this characteristic, with incredibly fast and sensitive controls onboard the 6-seater light aircraft. Takeoff is a blast in the E1000, literally. A full power rotation took me less than the distance to the end of the touchdown zone at the airport I tried it at, with the 150 kt mark falling before I had even crossed the other threshold, and mind you, this was on a half-full tank. Heavier loads yield less impressive takeoff rolls though, so I’ll chalk up the purely insane takeoffs to the simple beast of the E1000. In the air, the E1000 handles much like you’d expect a Pratt & Whitney PT6-engined aircraft to - nimble and fast, with only small control inputs required. On lighter loads, it handles more like an aerobatics aircraft than a six-seater leisure aircraft! Landing is a rather unique challenge with the E1000, simply because of all the power housed within the engine a few feet in front of you. I’ve found the flaps on the E1000 are far more effective at generating lift than other aircraft, so be careful when you deploy them or keep the trim hotkey in close proximity! I’ll mention it again: only small adjustments are required here - something I learnt the hard way with my 737-esce landing technique of massaging the yoke down! In conclusion, the E1000 is a solid aircraft at a reasonable price point. Aerobask have really done it again with the visuals, with very little to fault on either the exterior or interior modelling. 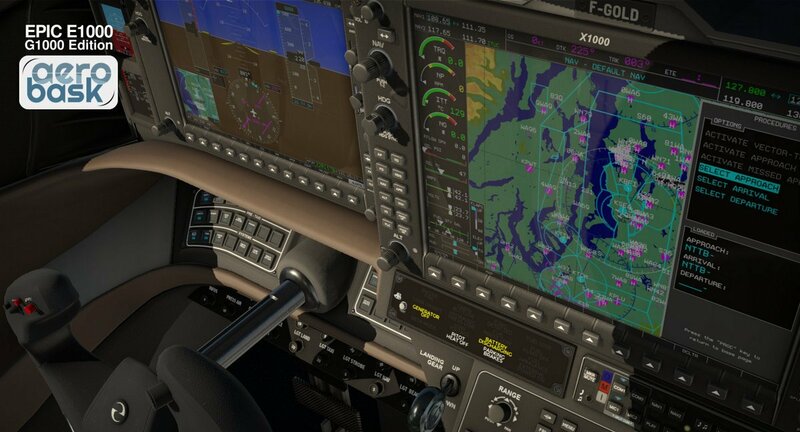 X-Plane G1000 integration is very good, with some good extra tweaks thrown in on top of the default systems to spice things up - “touchscreen” effects are nice if not a little unrealistic. Sounds, as we’ve come to expect from Aerobask’s recent line of products, are very high quality. Both engine and ambient noises are represented very well, with even uncommon sounds like that of a crash scenario (yes, I tested that..) included. If you’re looking for a speedy yet business-like aircraft, I would very much recommend taking a look at the E1000, as it caters to both types of flying with it’s incredibly powerful PT6A engine. The Aerobask E1000 comes in at a pretty reasonable price of $34.95 - for this, you get some fantastic visual modelling, high-quality sounds and the handling of your own private leisure aircraft, which also doubles as a nimble, sleek craft for streaking across the sky with. I would recommend the E1000 to anyone with a little empty space in the hanger for an aircraft such as this, or looking at getting into the leisure plane genre for the first time. The E1000 has a much smaller learning curve than those of some of the other options on the market, making it far more accessible to beginners. Lastly, I'd like to thank Aerobask for giving us the oppourtunity to review their wonderful E1000 G1000 Edition. 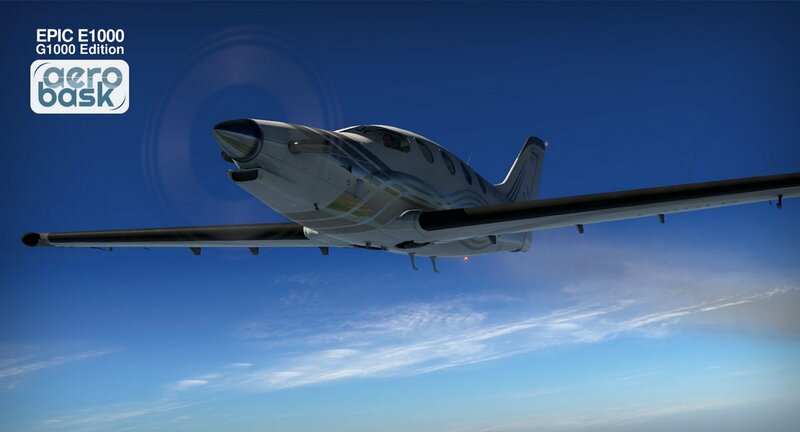 If you’d like to purchase the Epic E1000 by Aerobask for yourself, you can find it for $34.95 over on the X-Plane.org Store.